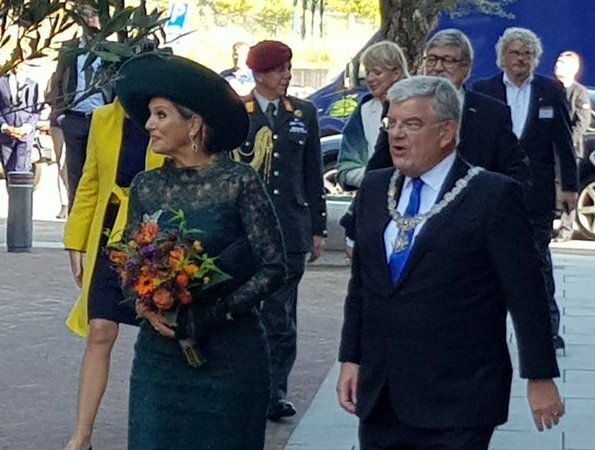 Dutch Queen Máxima attended Leidsche Rijn's 20th anniversary celebrations on October 5, Friday. Leidsche Rijn is the biggest construction site of Holland. 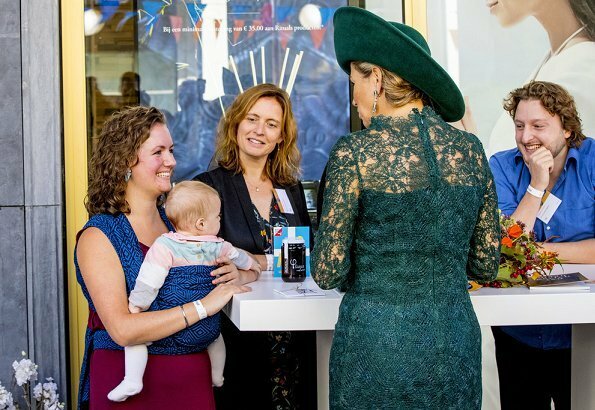 Official celebrations took place at Brusselplein shopping center in the center of Leidsche Rijn and Queen Maxima met with the residents of Leidsche Rijn. Leidsche Rijn currently has a population of 85.000, as the west part of Utrecht municipality. In October 1998, the construction started and the first resident began to live in Langerak area. 30.000 houses will be built in this new district of Utrecht by the year of 2025. She sure is worth her money as a quuenish appearance with her big emeralds. But here it is of course OK. She looks very good. Green looks good on her. Not a fan of the lace dress here which would be better at a wedding or garden party. Hat is too big and saucer-like for me but at least it covers her hair. 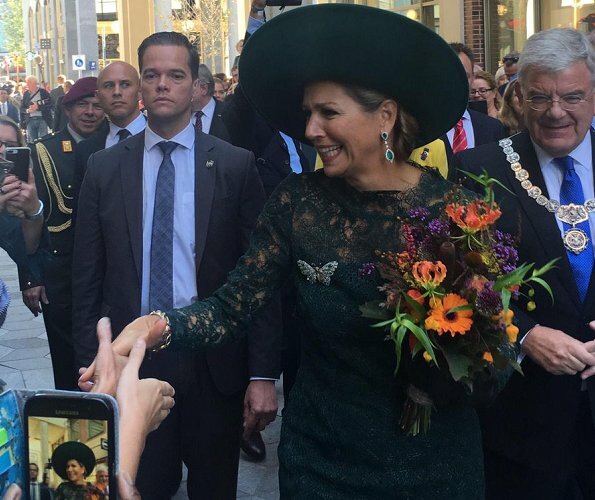 Maxima is hier heel knap, de donkergroene kleur staat haar prima. 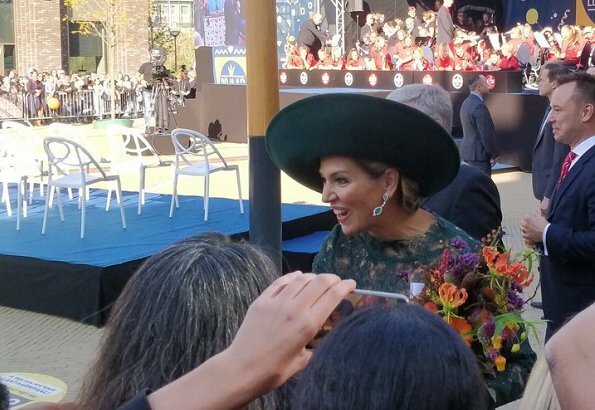 Maxima in another big hat. I know many here just brush it off by saying "that's just Maxima". Can you imagine the condemnation Meghan would receive if she had started wearing hats like this? I do like Maxima in this color, but think she would have looked better in a smaller hat. I was comparing people's responses, not the royals. "Can you imagine the condemnation Meghan would receive if she had started wearing hats like this?" Of course we can, and rightly so. 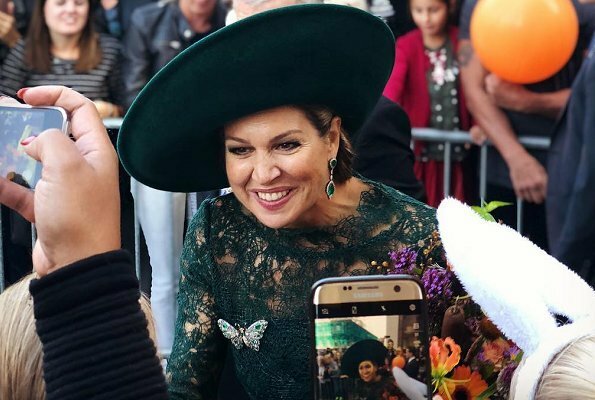 Meghan would look ridiculous wearing Maxima style hats. They are two completely different characters, personas, figures, styles. Why even make such a remark? I agree. Maxima has a larger than life personality and after a very rough year with loosing her sister she is bouncing back slowly but surely. I love her dress and she wore one similar a little while ago. As for the hats, I do not think too many people could pull them off but she can and they suit her. 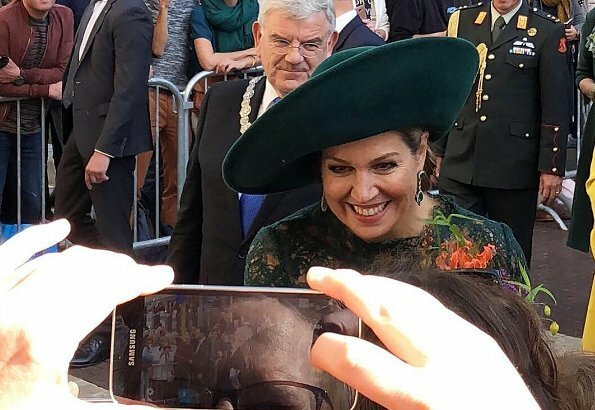 Maxima also looks ridiculous in the oversize hats, big personality or not. Let us not criticize the hat. At least it covers that hair. Nice dress the color is great she looks very good love her hat. She can wear them,always looks good in them. I like her lace dress her jewels ,shoes and her big smile the most. I agree totally..she is very natural with no airs and graces. No matter what all the foreigners say...We Dutch LOVE her the way she is. All of the comments I read here I never read on Dutch blogs, as she is immensely popular, even all the bad hair days, and the over the top clothes are forgiven. We love her for her personality and her hard work. I think your queens have been extremely popular for long time, not just Maxima but Beatrice, Juliana and Wilhelmina as well. Maxima loojks to be such a mesmerizing person and love her work, what is of course very good thing and you Dutch are lucky. Radiant,smiling,lively Maxima- her outfit embraces her features of character but also gives a bit of royal glamour. Maxima looks lovely here - the shade of green is really flattering. Love the dress style and I think she rocks big hats. 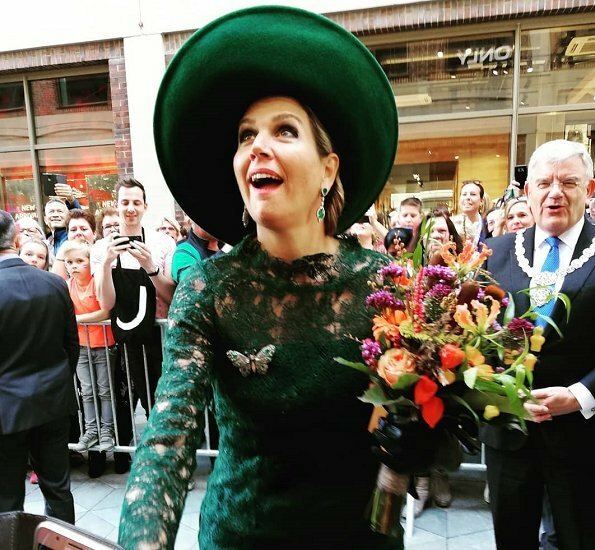 I think that she and Princess Caroline of Monaco are two women who have the personalities to carry off those rather exuberant hats. Stunning!! Regal and exhuberant, of course she is overdressed, and so what?? She is the Queen of everything big and sunshine, and big smiles. Kudos for her. I do not care for all the lace or the hat. Maxima is so "over the top" and I love her for it! Yes, wear extravagant outfits when you have the style to pull it off! She looks amazing here. Superb outfit for a wedding! Seems a little overdone for a daytime engagement but like most folks, I shrug & say "That's Maxima". Prefer overdone to understated and at least those who come to see her can appreciate that she has made an effort. Wonderful. That is all that matters anyway. And what is wrong with a big hat? Nothing really. Often Camilla and occasionally Sophie Wessex and even Kate wear big hats. Maxima is so committed to helping and works so hard! 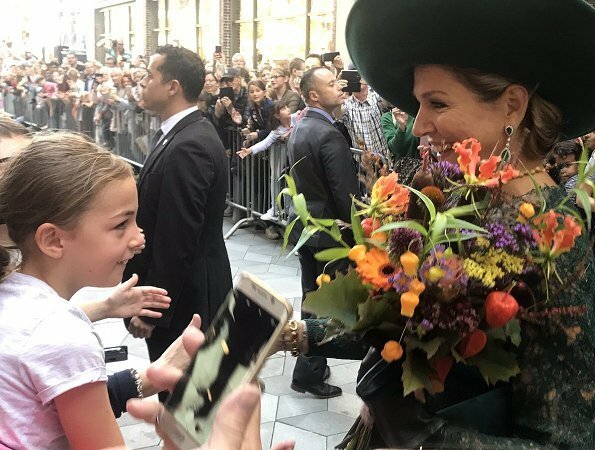 I understand all the positive comments about Maxima's personality and style, and also that the Dutch population likes it all. I think today's lace dress shows however that is reaching the limit of this style being adapted to her morphology, ie some weight she has taken over the last months - natural for her age, the same applies to Mathilde incidently. This is why I am so admirative of Qn Letizia, who by the way is also very committed to her job. Well said! As I read through all these comments it seems some see Maxima as hard working and very outgoing which gives her the right to wear big hats. Others see the big hats as overstating and obnoxious. While probably none of us know her, who knows her real motives. What we can look at is how hard working a royal is from week to week which is why I appreciate Mary T's comment. Letizia is very hard working while always taking the time to make her hair and clothes lovely. I agree. She brings evening wear into daytime. And I thought the same thing about the butterfly brooch. Her dress is a little too tight and short, and I think the lace is too much for the event. I am in love with her shoes, btw! Yet, if she scaled it back too much, she would not be herself.